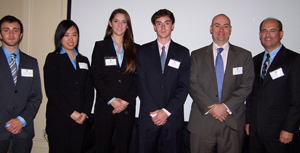 Four students in the supply chain management program at the Whitman School of Management recently traveled to New York City for the fourth annual Dahlman Rose & Co. Global Transportation Conference. Seniors Jorie Richlin-Zack, Laura Mun, Kevin Kennedy and Jonathan Carrubba attended the two-day conference, which highlights the importance of the transportation industry within the global economy and promotes interactive discussions between management and investors. The trip was hosted by Whitman alumnus Jason Seidl ’93, director of the equity research department at Dahlman Rose & Co., an investment bank specializing in the global natural resources supply chain. Seidl covers the airfreight and surface transportation sectors at Dahlman Rose, and has been recognized for both stock pick and earnings accuracy by several nationwide analyst surveys, including the 2008 Financial Times World’s Top Analysts awards. Conference keynote speakers included Daniel R. Elliott III, chairman of the Surface Transportation Board, U.S. Department of Transportation; Capt. David Bates, president of the Allied Pilots Association (APA); and Adam M. Pilarski, senior vice president of AVITAS. While in New York, students also had the opportunity to learn from and network with Whitman alumni and industry professionals, including Whitman’s Franklin Supply Chain Management Advisory Board president Matthew Menner ’94, senior vice president, sales and alliances, Transplace; board member John Levine, president, Pinsly Rail Co.; and board member Pat Hackett ’84, director of international supply chain for Bed Bath & Beyond.